First, we'll look at the different loci that affect coat color in the Great Dane. In each series, the possible alleles will be listed in terms of dominance, with the more dominant genes at the top, ranging to the most recessive at the bottom. The usual convention is to have the dominant gene capitalized, with recessive genes in lower case letters. To begin, we'll touch on three series, the A-series, the E-series and the D-series. While all three do affect coat color in Great Danes, my intention here is to discuss primarily the Black, Harlequin, Mantle, Merle and White colors. All of these colors are AA, EE, and DD. A-series: This determines the "base" color of the coat. Dogs have two forms of melanin in their coats. One, eumelanin, is dark. It varies in color due to variations in the protein that forms the framework of the pigment granule. The base form of eumelanin is black. Eumelanin can also be brown (also called chocolate or liver) or blue-gray. The other pigment, phaeomelanin, ranges from pale cream through shades of yellow, tan and red to mahogany. - A Dominant Black, eumelanin can appear everywhere. A is seen in Black, Blue, Merle, Harlequin, and White Great Danes. - ag Agouti or wolf gray (not present in Great Danes) Each hair is banded with eumelanin and phaeomelanin. - ay Sable Each hair is the phaeomelanin color with eumelanin only at the tip. The ay genotype (always homozygous in Great Danes, acts, IN DANES as a simple recessive to A) is responsible for the base color in Fawn and Brindle Danes. Modifiers can increase or reduce the amount of black tipping. In Great Danes, we have selected for modifiers to reduce this tipping, although it is still often visible at the base of the tail and around the ears. - at Tanpoint, Doberman and Rottweiler color (not present in Great Danes) Eumelanin color with only phaeomelanin at the "points" on the face, legs, under the tail. - as Saddle, more tan than tanpoint, seen in German Shepherd Dogs (not present in Great Danes) As tanpoint above, but with far larger areas of phaeomelanin only. E-series: The E-series is poorly understood and very controversial. In the simplest form, E=can produce eumelanin, and e=only phaeomelanin is produced (regardless of the A-series genes, and ee dog will show ONLY the yellow/red pigment, as is seen in yellow Labradors and Irish Setters.) There are some theories that Masking (as on our Fawns) and "Brindling" are also on the E-series. Other research indicates that one or both of these traits are at a different locus altogether. In any case, all Great Danes can produce black pigment. For now, I'm assuming (only further research will allow us to know for sure) that "Brindling" is on separate locus, that I'll call Br=Brindle, br=not-brindle. What is clear is that Brindle is dominant to Not-Brindle. D-series: This determines whether the recessive gene that makes the eumelanin Blue instead of Black is present. There are only two alleles. - d Blue dilution. All areas that the A-series codes as Black will be Blue in color. Note that dd can affect the mask and/or stripes in Fawns and Brindles. C albino series. All Great Danes are C, no albino traits. Other more recessuve alleles range from slight to full fading of color. G graying The dominant G causes puppies that are born dark, with the color fading as they mature. All Great Danes are gg, no graying. T ticking series. The dominant T produces individual pigmented hairs through spots of colored hair in otherwise white areas on the dog. All Great Danes are tt, no ticking. B brown The recessive causes the eumelanin to be red/brown in color. The recessive b should not be present in Great Danes, although there is some chance that it is. The homozygous recessive bb produces red Doberman and chocolate Labradors. If present, it could produce chocolate Danes, "red merle" Danes, or a brown mask and/or stripes on Fawns and Brindles. 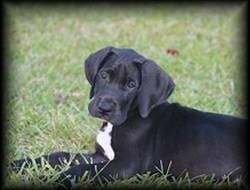 So, the Black, Harlequin, Merle, Mantle, and White Great Danes are ALL AAEEDDCCggttBB. To simplify discussion, we will ignore these genes in the rest of our discussion, as all loci are homozygous for a particular gene, these alleles will not vary from individual to individual.